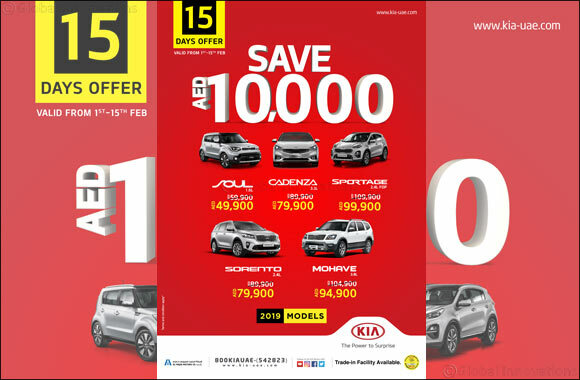 Dubai, United Arab Emirates, 6 February 2019: Al Majid Motors Company, the automotive division of the Juma Al Majid Holding Group and an exclusive distributor for Kia Motors in the UAE, is offering an unprecedented bonanza for Kia customers, with a straight-off AED10,000 discount on the price of 2019 model Kia vehicles for only a limited period. Until Feb. 15, Kia customers can get the never-before-deal of an AED10,000 discount on 2019 models of Mohave, Sorento, Sportage, Soul and Cadenza, in addition to value deals on other types of cars at the Al Majid showrooms. With the limited period offer, a Kia Soul will cost only AED49,900 as against the regular price of AED59,900. Similarly, a 2019 Cadenza and Sorento come for just AED79,900, the all-new Sportage, the loaded version, is priced only AED99,900, and the new model of Mohave is priced just AED94,900. Designed with the convenience and safety of customers, all Kia models come with several exceptional features that have made the brand one of the most-loved in the UAE. To know more about the features, try them first-hand, and to drive home in a new Kia car with the added benefit of an AED10,000 discount.